Intense, passionate feelings of love can provide amazingly effective pain relief, similar to painkillers or such illicit drugs as cocaine, according to a new Stanford University School of Medicine study. Scientists aren’t quite yet ready to tell patients with chronic pain to throw out the painkillers and replace them with a passionate love affair; rather, the hope is that a better understanding of these neural-rewards pathways that get triggered by love could lead to new methods for producing pain relief. The concept for the study was sparked several years ago at a neuroscience conference when Aron, an expert in the study of love, met up with Mackey, an expert in the research of pain, and they began talking. “We posted fliers around Stanford University and within hours we had undergrads banging on our door,” Mackey said. The fliers asked for couples who were in the first nine months of a romantic relationship. “It was clearly the easiest study the pain center at Stanford has ever recruited for,” Mackey said. “When you’re in love you want to tell everybody about it. “We intentionally focused on this early phase of passionate love,” he added. “We specifically were not looking for longer-lasting, more mature phases of the relationship. We wanted subjects who were feeling euphoric, energetic, obsessively thinking about their beloved, craving their presence. Researchers recruited 15 undergraduates (eight women and seven men) for the study. Each was asked to bring in photos of their beloved and photos of an equally attractive acquaintance. The researchers then successively flashed the pictures before the subjects, while heating up a computer-controlled thermal stimulator placed in the palm of their hand to cause mild pain. At the same time, their brains were scanned in a functional magnetic resonance imaging machine. 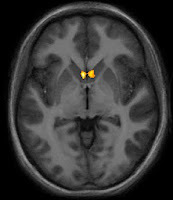 The undergraduates were also tested for levels of pain relief while being distracted with word-association tasks such as: “Think of sports that don’t involve balls.” Scientific evidence has shown in the past that distraction causes pain relief, and researchers wanted to make sure that love was not just working as a distraction from pain. Results showed that both love and distraction did equally reduce pain, and at much higher levels than by concentrating on the photo of the attractive acquaintance, but interestingly the two methods of pain reduction used very different brain pathways. “With the distraction test, the brain pathways leading to pain relief were mostly cognitive,” Younger said. “The reduction of pain was associated with higher, cortical parts of the brain. Love-induced analgesia is much more associated with the reward centers. It appears to involve more primitive aspects of the brain, activating deep structures that may block pain at a spinal level — similar to how opioid analgesics work. “One of the key sites for love-induced analgesia is the nucleus accumbens, a key reward addiction center for opioids, cocaine and other drugs of abuse. The region tells the brain that you really need to keep doing this,” Younger said.